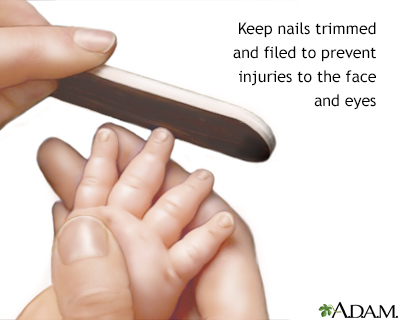 Newborns have fingernails that are usually soft and flexible but that can cause injuries to the infant because they do not yet have control of arm, hand, and finger movements and may inadvertently claw at their face. Nails should be carefully trimmed with small, blunt-tipped scissors. Use an emery board to keep the nails smooth.